The Revolutionary Socialist League began as a small breakaway body of Trotskyist intellectuals closely associated with the Labour Party in Britain during the height of the Cold War. In 1964 it founded a radical newspaper, Militant, to promote its far left agenda, eventually giving the grouping its new name, the Militant tendency. From this era onward it sought to gain influence over the mainstream party through a strategy of infiltration and entryism. For a brief period in the 1970s and ’80s it enjoyed some clandestine popularity, gaining access to the leadership of Labour and control of its youth wing, the Young Socialists. However its conspiratorial nature and obsession with in-fighting eventually became its undoing and by the 1990s it was forced from the party, emerging first as Militant Labour in 1991 and then as the Socialist Party with a relaunch in 1997. However the grouping invariably fielded candidates for election under the guise of various front organisations including the Socialist Alternative, the Socialist Alliance, the Socialist Green Unity Coalition, the No to EU – Yes to Democracy group, and latterly the Trade Unionist and Socialist Coalition, albeit in each case with minimal returns (unless one counts the anti-EU Brexit vote in the UK which the SP enthusiastically supported). Interestingly this very British cadre of Trotskyist radicals also had a “regional” branch in Ireland during the 1980s, similarly known as the Militant tendency. Looking to London for inspiration – and direction – it sought to control the local Labour Party, albeit a more staid version of the one in Britain. Despite the same entryist tactics as its UK peers, the grouping failed to make much headway in the far more conservative arena of Irish politics and was eventually expelled from the mainstream party in 1989, briefly emerging as Militant Labour before renaming itself the Socialist Party (SP) in 1996. And like its mother party in the United Kingdom, the Irish SP joined an international communist organisation called the Committee for a Workers’ International (CWI), a controversial governing body for a number of far left parties, based in London. Since 2011 the SP has stood for election using various front organisations, including the United Left Alliance (ULA), the Cross-Community Labour Alternative (CCLA) and most successfully, the Anti-Austerity Alliance (AAA). The latter grouping was in turn part of an electoral coalition with the People Before Profit Alliance, a front organisation for the Socialist Workers Party (SWP), a rival Trotskyist grouping whose British sister party, of the same name, competes with the original Socialist Party in the UK. 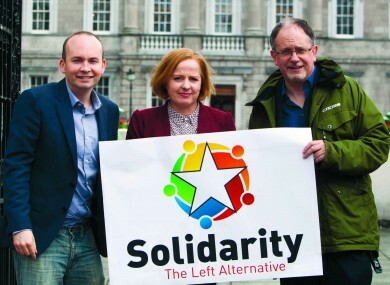 For reasons best known to itself, the Socialist Party has now decided to rebrand the AAA as Solidarity – the Left Alternative, albeit with some controversy. As well as a new logo (apparently an off-the-shelf purchase from Shutterstock with some amateur editing in Photoshop) the front group will require a website, social media accounts, emails, branded publications, promotional materials and so on. But to what effect? One has to wonder at the ideological hollowness of the non-republican left in Ireland, its conspicuous lack of confidence in its own identity, and frequent recourse to electoral or campaigning subterfuge. While members of the Socialist Party/AAA/Solidarity may look down their noses at Sinn Féin and its off-shoots for their insurgent backgrounds it seems that the SP finds it equally hard to abandon its own conspiratorial or entryist roots. Ha! Babhla bainne don Sionnach! Why don’t Sinn Fein (and indeed all other professed Republican political groups call out the Socialist Party for what it is – an Irish Unionist party? The Socialist Party is every bit as Unionist as the DUP or the Ulster Unionist Party – much more so in a way, as the SP want the whole of Ireland to be reintegrated into the UK. The Workers Party was clearly a British intelligence front group (for irrefutable evidence of this, see the book, “The Lost Revolution: The History of the Official IRA And The Workers Party”), but even it never went as far as advocating that Ireland rejoin the union. The Socialist Party is in a way a modern incarnation of the British Irish Communist Organisation – another British intelligence front group, the role of which was to “gaslight” those of a radical persuasion when it came to the Irish question. A ridiculous interpretation of what I said: I’m not a fan of modern Sinn Fein at all, but the Socialist Party is a Unionist Party – there’s no argument about that. I might add its supposed economic radicalism is also deeply suspect – as indeed was the Workers Party’s. Their role seems to be to coopt opposition to banker imposed austerity into officially approved modes.The so called anti-austerity left in Ireland could have halted the Troika’s gallop any time by calling for a general strike and a boycott of the media that supported the austerity agenda of longer working weeks,income tax hikes, the property tax, privatisation, etc. The fact that they did none of this speaks volumes about the phoniness of their posturing. Where there is a Trotsky, a Stalin will soon follow. As we can readily observe by the overt use of the same symbolism, extreme unionist factions regardless of proclaimed political affiliation, are almost always Nationalist-Socialist. I’m not a fan of Stalin but arguably he was more of a socialist than Trotsky – who along with Lenin handed over Russia to western capitalist interests via the New Economic Policy. Stalin was no socialist. He clearly did not share any gains his political party made with the rest of the nation’s people. They often starved while those in power shared no hardship. He was a despot, pure and simple (a nationalist, intent on focusing the revolution on Russia alone – very similar to the “revolutionary” concepts of the German NSDAP, the Nazis, some years later). Furthermore, the NEP was not supported by Trotsky. Lenin’s basis for the NEP was state-run capitalism being the last form of capitalism before communism is completely installed, and termed it a “temporary retreat.” He believed that because of the dire economic situation post-revolution, this would give incentive for increased production (which, in effect it did, and most historians agree that it initially brought considerable economic recovery to Russia). Stalin along with the more conservative members of the party supported this position. Trotsky and the more left oriented members of the party opposed this position, and believe Russia would only be able to survive, if all output would be controlled and disbursed by the state (which is the more socialist concept, IMHO). Stalin ended the NEP and implemented collectivisation and the five-year-plan model following the grain-procurement crisis in 1928, some two years after Trotsky had been trounced from his polit-bureau seat. Many historians attribute the crisis to bad harvests and the political response in part to curtail excessive profit-making and corruption, which had become commonplace before the crisis (k.a. the scissor-crisis), but mostly to firmly establish the power of the party over the peasants, as it had eroded from meager support to, in some cases, outright opposition. I am also not a fan of austerity for the masses to pay for debt incurred by the already fat cats stuffing their pockets. There is no doubt AAA is correct in some of its assertions…but the rest of their program? I do read history. Trotsky focused on militarisation and organisation, stayed in the weeds too much instead of gaining true oversight, and, as Lenin said, had “no clue” regarding politics. His lack of appreciation for the political realities sidelined him and opened the way for Stalin. Getting sidelined and replaced is a hallmark of this political conviction, as similar to their namesake, ignoring the realities only buys you a short time at the top. Unfortunately, often a Stalin-style fascism follows it. I am a strong believer in socialism, just not that kind. I appreciate rule-of-law democracy, with opportunities and the ability for individuals who wish to excel to do so (otherwise there is no real progress), while providing a generally acceptable minimum living and education standard for all. Even that is really an unrealistic concept, as greed and corruption will always create a type of class system, which is subject to its upheavals. People, when they have their bread and games, are just hard to motivate to take interest in politics. Ach cad faoi na luchta oibre?! More seriously though, why didn’t Ireland develop its own left wing workers’ party, did the Troubles overshadow things so much that SF had a clear run? You ask ‘why didn’t Ireland develop its own left wing workers’ party’? I thought the pre-split Sinn Fein ultimately morphed, many years post-split, into The Workers Party, also (non)affectionately known as the Sticks. And they finally morphed into Democratic Left before joining An Lucht Oibre, which, er, has 4 seats in the Dail and may have 6 after Fianna Fail pulls the rug and another election is held, possibly in 2018. But they’re really the Socialist Party, behind it all, you see? But they’re actually the Socialist Workers Party, the good old SWP. But they registered as one party – are you getting confused yet? If you think you’re all mixed up, it surely baffles me. ‘Who’s with them now ?’I ask, it’s all a mystery. So I’m going to establish an all-encompassing group. This crazy kaleidoscope will surely blow your mind. You’ll be relieved to hear – Sinn Féin is still Sinn Féin. Poem of the Year. Keep writing and they’ll nominate you for the Nobel. 🙂 I enjoyed the SP-AAA-S people getting very hot under the collar the other day when quizzed about the party name. CWI is Trotskyist, not Communist. Well now, I understand the intra-leftist argument, but I doubt that many outsiders would see the difference. Trotskyism is a form of communism, and the CWI by extension is communist. Yeah, you can get into arguments of what is and is not communism, but it is like SF defining Saoradh as non-republican (or “dissident”). The term has a broad applicability. and your blog with reference to “far left agenda” sounds more like the Irish Daily Mail. SF hate Murphy after he accused Sinn Féin as ‘sectarian’ and questioned the party’s credentials as a force for the Left on The Pat Kenny Show a while back. Nationalism is a narrow allegiance/loyalty to one’s country, Socialism is allegiance to all human kind. I agree with the first paragraph and have stated as much on ASF several times. I voted SP-AAA in the past and may do so again precisely for the reasons you outline. The party, as I have said many times, has done this Republic and our democracy some service. However I think it fair to outline it history and its entryist culture. Likewise to discuss its aim of a federation of the “British Isles” seems to me to be just. If the party advocates it then it should be able to defend it not jump straight to attack mode whenever the policy is raised. I accept your points and welcome them. However some SP-related people have been somewhat less polite in their private communications. Thanks for the Comment. Relax yourself, Jack a mhac. You’re tending towards the militant there. I agree with Jack’s comment, except for the Daily Mail slight. There is a far-left agenda (perhaps better called a far-far left agenda? So far left it meets the far-far right?) not dedicated to the allegiance to all human kind. Currently, with most people on this earth clearly dedicated to the construct of their individual nation or ethnicity, in order to adequately protect and ensure the liberties and cultural identity of those who have charged one with their leadership, a policy of national interest is unavoidable. I do not see that changing in the near future.